St. Martin's Press, 9781250101884, 256pp. On his very first day of school as a substitute teacher, Cinque Henderson was cursed at and openly threatened by one of his students. Not wanting trouble or any broken bones, Henderson called the hall monitor, who escorted the student to the office. But five minutes later the office sent him back with a note that read, “Ok to return to class.” That was it: no suspension, no detention, no phone call home, nothing. 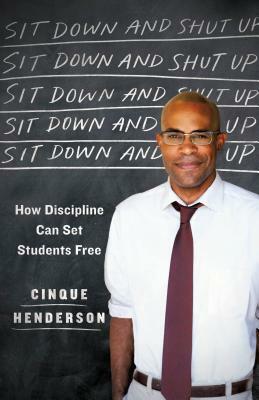 Sit Down and Shut Up: How Discipline Can Set Students Free is a passionate and personal analysis of Henderson's year as substitute teacher in some of America’s toughest schools. Students disrespected, yelled at, and threatened teachers, abetted by a school system and political culture that turned a willfully blind eye to the economic and social decline that created the problem. Henderson concludes that the failures of our worst schools are the result of a population in crisis: classrooms are microcosms of all our nation’s most vexing issues of race and class. The legacy and stain of race—the price of generational trauma, the cost of fatherlessness, the failures of capitalism, the false promise of meritocracy—played itself out in every single interaction Henderson had with an aggressive student, an unengaged parent, or a failed administrator. In response to the chaos he found in the classroom, Henderson proposes a recommitment to the notion that discipline—wisely and properly understood, patiently and justly administered—is the only proper route to freedom and opportunity for generations of poor youth. With applications far beyond the classroom, Henderson’s experiences offer novel insights into the pressing racial, social, and economic issues that have shaped America’s cultural landscape. Sure to ignite discussion and controversy, Sit Down and Shut Up provides a frank evaluation of the broken classrooms of America and offers a bold strategy for fixing them. Cinque Henderson is a graduate of Harvard University. He has written for HBO's The Newsroom and is currently a writer for Showtime's, The Chi. His work has appeared in the Washington Post, the LA Review of Books, Newsweek and newyorker.com. Sit Down and Shut Up is his first book.